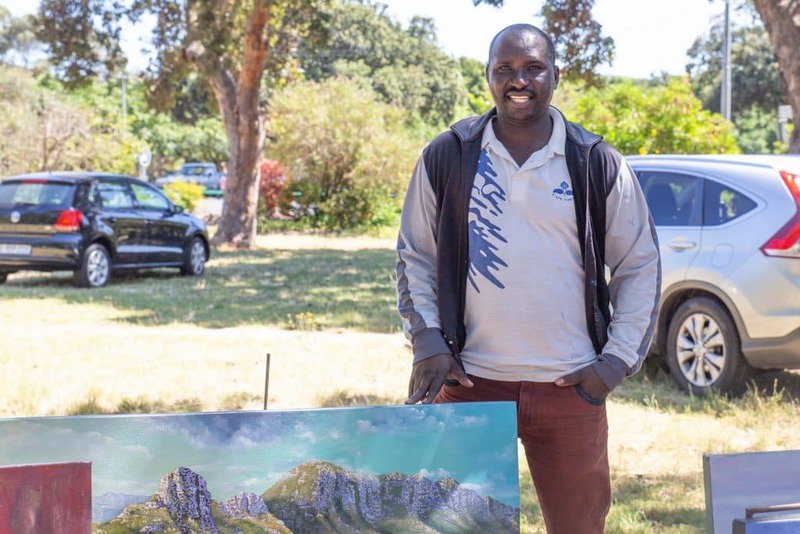 Rwandan born artist Eric Karangwa started with humble beginnings as a car guard but made his name well known in the local art community after breaking into the Cape Town art scene with his exquisite landscape paintings. His first exhibition was in the Constantia Village shopping center. It was a sudden affair and everyone pitched in to help. 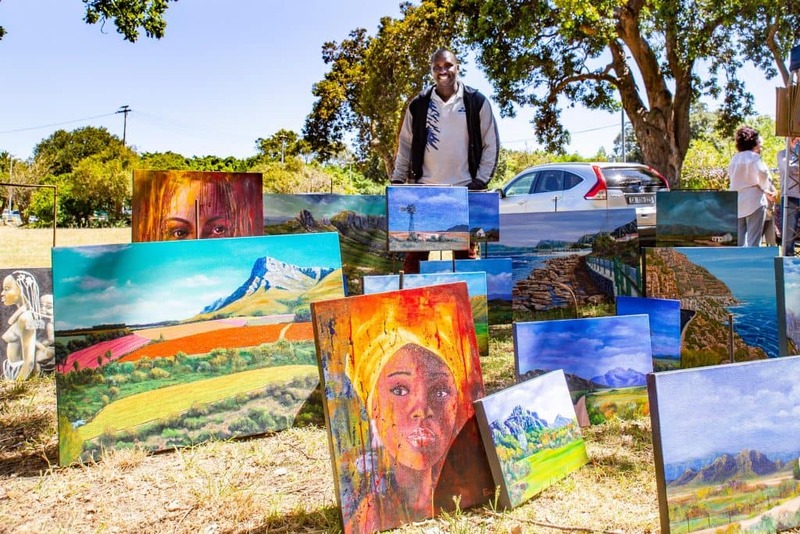 Our Constantia Village branch back then assisted with some easels for the exhibition and since then Eric has elevated his art and style to become the artist that he is today. It was after Eric’s first exhibition that his idol, landscape artist Andrew Cooper, heard about Eric’s admiration of Andrew’s work. Andrew introduced himself to Eric and they have been in a mentor relationship ever since. You can read more about Eric’s success story in From guard to ‘Van Gogh’ written by Tara Longardener for the Cape Argus. 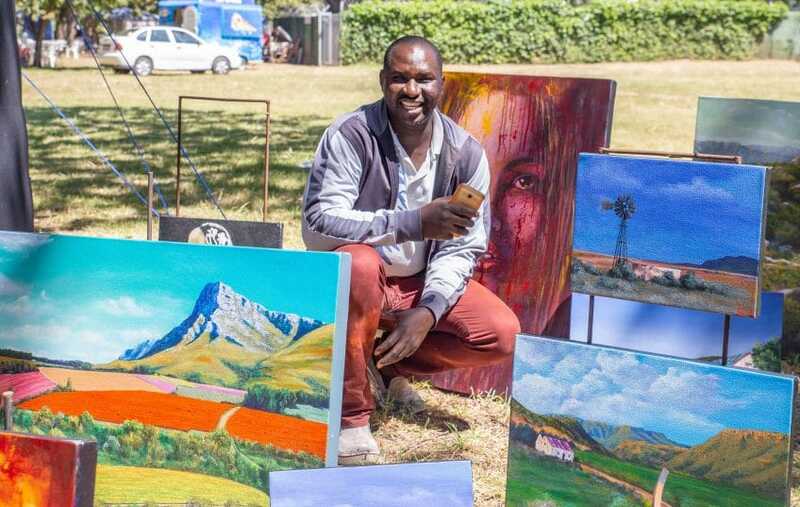 Recently we had the pleasure to reconnect with Eric Karangwa at Cape Town’s 2018 Art in the Park event and a lovely time catching up. 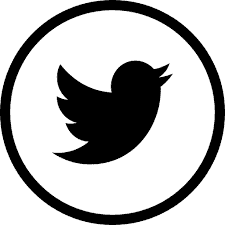 We asked Eric about how he finds opportunities to exhibit in the Cape Town art scene. He says it is quite a difficult task but that his mentor Andrew Cooper helps him find platforms where he can show his work. Knowing that many new artists find it difficult to price their art works, we asked Eric how he works out pricing for his pieces. He admits that Andrew advises him on pricing as he is more seasoned in exhibiting and selling original art. Painting with acrylic on canvas, Eric Karangwa has had great success with his landscapes of South African scenes. His landscapes evoke a sense of realism in an attempt to capture the sublime and serene compositions. His portrait works are generally more expressive and painterly. In February he took part in the group exhibition : Original Cape Art at Kirstenbosch Botanical Gardens. Here he exhibited alongside his teacher Andrew Cooper and other local artists like Lyn Northam , Inge Semple and Sue Paulsen to name a few. Eric is currently exhibiting in a group show called Art Portfolio at Richard Crowie Hall in Kirstenbosch Botanical Gardens. 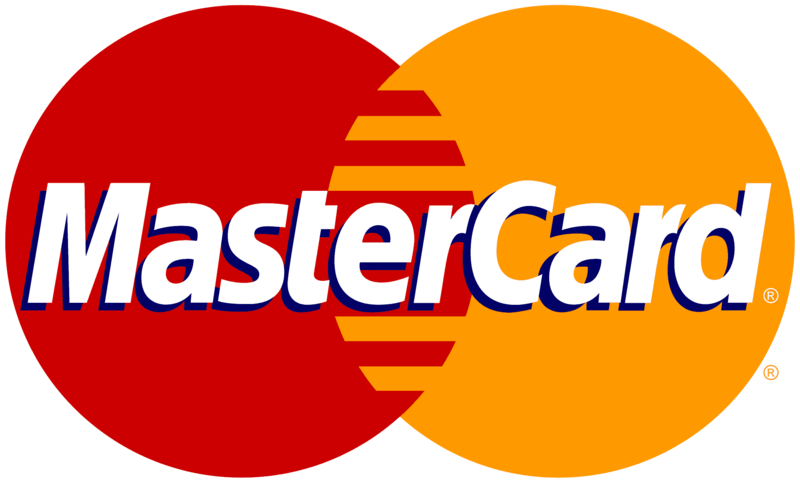 It will run till 17 April 2019. Make sure to go and support him if you are in the area. Also show him some support on his facebook page Erick Fine Arts . Also remember to check out our blog post on Cape Town’s Art in the Park . Maybe we will see you there next year!